Colostrum is literally ‘nature’s first food’. It is the pre-milk fluid that all female mammals give their newborn baby in the first few days after birth. Colostrum is a highly complex cocktail of vital immune and growth factors to help increase the natural immunity of a baby and to protect it against the diseases it will be exposed to, and assists with the development of the newborn into a strong and healthy adult. Human babies acquire their natural immunity boosters in the womb prior to birth, via the placenta. Breast feeding then provides the additional protection, which explains why breast-fed babies are generally healthier than those that are bottle fed. People in India have used colostrum as a traditional remedy for thousands of years. Research over the past two decades has proven that bovine (cow) colostrum is one of the most effective nutritional supplements available for supporting the immune system. It is also well renowned for aiding tissue repair. Each drop contains the promise of life: immunoglobulins, growth factors, antibodies, vitamins, minerals, enzymes, amino acids, and other special substances designed to help the body face a lifetime of invasion by various viruses, bacteria, allergens and toxins bent on destruction. The onset of almost all infectious and degenerative disease, including cancer and heart disease, is preceded or accompanied by lowered immune system function. Colostrum is unique in nature in that it is the only complete food to provide critical immune factors, such as immunoglobulins, leukocytes, cytokines, lactoferrin, interferon and prolene rich peptides (PRP), that the body needs to fight infection and restore immune function. Alpha Lipid Lifeline is from New Zealand, and is available in powder form, capsules and tablets. Doctors acknowledge that most disease enters the body through the mucous membranes in the intestinal gastric tract. The majority of the antibodies and immunoglobulins present in colostrum are not absorbed, but remain in the intestinal tract where they attack pathogens before they can penetrate the body's defenses. In addition, colostrum's growth factors help heal the bowel lining, balance intestinal flora and support proper digestive function. However, not all colostrum is the same. Health Coach International endorses colostrum from New Zealand as the colostrum harvested from cows raised in New Zealand is superior to any other colostrum in the world. This is all due to the ideal pure climate, pesticide, antibiotic and BSE-free pasture-fed cows, highly regulated farming techniques, and a multi-million dollar investment in the equipment necessary to best process colostrum properly. No other colostrum can compare. 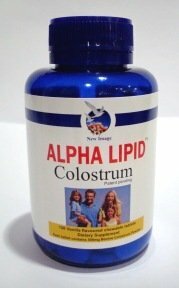 Alpha Lipid Pure Colostrum tablets are easily swallowed and you can even open up the capsule and pour out the contents to use it physically and directly onto food.